She Who Must Be Obeyed picked up a nice small wild Sockeye Salmon fillet. We were busy (it was suggested I was lazy but that is crazy). I was instructed she wanted it done on the smoker. Normally, that would involve brining and a long cold smoke. I decided to just give it a rub and smoke it at a low temperature. This is easy defined. 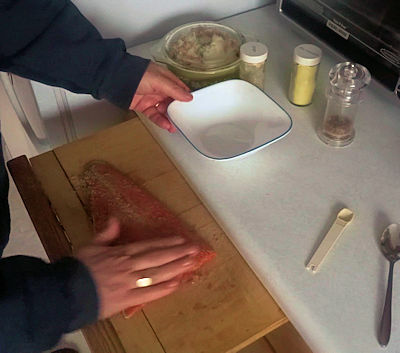 I mixed together the rub ingredients and spread them on the salmon. 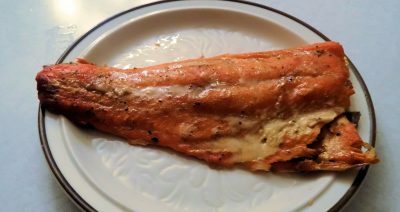 I preheated my Louisiana Grills smoker to 190 F.
I smoked the salmon to an internal temperature of 145 F which took about 1 hour 20 minutes. I did a video of this cook. Despite being easy, this had a nice moist texture, a touch of sweet, a touch of ginger and a kiss of smoke! Delicious. She Who Must Be Obeyed liked it but did continue to suggest I was lazy. 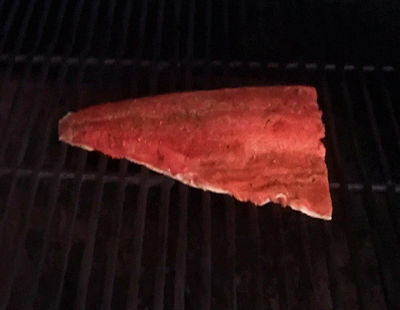 Preheat your smoker to 190 F.
Mix the rub ingredients together and rub into the surface of the salmon. 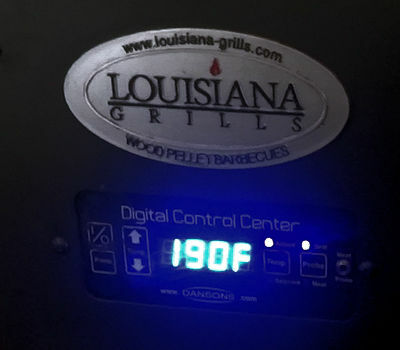 Smoke to an internal temperature of 145 F, about 1 hour 20 minutes. Husband has been itching to get something smoked, and wants to get out to the smoker when we have a mild day. I am going to suggest this be his next smoking conquest! A husband who will cook you salmon is a good husband! I assume the Ginger is Dry Ginger Powder. I always have fresh Ginger in fridge or freezer. Fresh vs. powder is so different and it would make a difference.